Universities have various resources such as spatial, human, and economic. Utilizing these resources, universities have contributed many things to local communities. These types of actions are called the “social contributions of universities”. Social contributions have played a very important role in the development of communities. They can also improve the way in which universities coexist within them. Some people may think that a university’s social contribution to the community is unnecessary because of the questionable ways in which the university itself benefits. However, one of the university’s original goals is volunteering, with the other two being academic sand the pursuit of knowledge. This explains why many universities have given back to their communities in terms of volunteer work. Until recently, the social contribution of universities was mainly fulfilled in indirect ways such as sending motivated students out into society. In contrast, universities today contribute to local communities in various and more direct ways. The University of Seoul (UOS), as the only municipal university in Korea, has also made numerous social contributions to the city of Seoul. It offers many activities for its citizens and has cooperated with diverse local institutions. In honor of UOS’s centennial anniversary, The UOS Times focused on the social contribution of UOS. This article will look at cases when UOS made social contributions and explain them in detail to students. The social contribution of universities can be divided into three types in according to the *thesis of The Seoul Institute. The first type supports the community by providing facilities such as parking spaces, libraries, museums, and an open campus to local residents. The second type is economic support to local organizations. The third type is educational and human resources such as students and professors. The first type of social contribution is facility support. Facility support is done by allowing citizens to utilize certain facilities or space owned by the university. Facilities such as parks and libraries can improve the lives of local residents, bringing positive effects to the local society. Often, the local society lacks such facilities. The old districts of Seoul are one example. Developed rapidly during the 20th century, many areas did not have sufficient urban infrastructure from the start. Furthermore, Seoul is not a favorable place to expand such facilities due to its high land price and rarity of available land. If the citizens are allowed to use the facilities of a nearby university, the problem can be partially solved. Other facilities that are open to citizens are: the museum, the library, and some sport facilities. The University Museum allows citizens to visit and see its exhibitions for free. Everyone can go in and out without restriction. Citizens can also borrow books from the three university libraries at UOS. The library allows registered citizens to do so if they pay a deposit for the book. To register, the citizen must reside in Dongdaemun-gu and should be over the age of 19. In addition, citizens can use some sport facilities, such as the basketball court, but they need a membership and should make a reservation for such facilities charges. This will also be charged a modest fee for use of these types of special facilities. The second type of support is financial support. 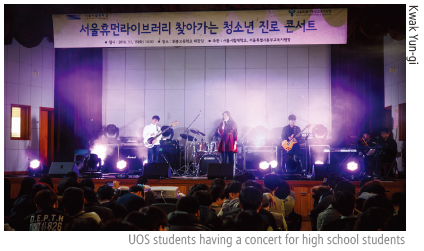 Unlike most universities in Korea, the UOS is publically-funded. It has therefore experienced some difficulty supporting local institutions financially. However, there were many cases in which UOS students spontaneously donated money or old clothes to local institutions on behalf of the UOS. Last year, UOS students donated one million KRW earned from the school festival to the Dongdaemun-gu office. The last type of support is providing education and human resources. It again can be divided into three parts: university administration, students, and professors depending on who has done the work. UOS has put several cases into practice for each part. The university is a typical tertiary educational institute. As an educational institute, sometimes the university provides educational services to citizens and the society. The Department of Fire Protection at UOS is no ordinary department. 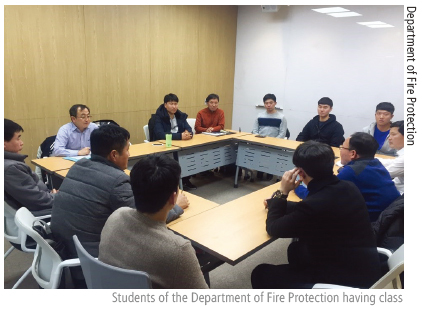 The department was established in 2007 to provide tertiary education for local fire officers in Seoul. It provides education about how to react actively to the urban environment of Seoul. 50 students enter the department every year. The faculty is composed of part-time instructors who are experts in the fire protection field and professors of UOS who teach liberal arts lectures. The curriculum of the Department of Fire Protection is similar to other departments. Students have to attend both liberal arts lectures and major lectures. Through the curriculum, students learn about systems, policies, and technologies related to fire protection. This allows graduates to take roles in various areas within the fire protection field. Additionally, the curriculum helps students to obtain certificates related to their field. According to an official of the Department of Fire Protection, opinions about the program are very positive. The department will continue to contribute to enhance the local fire service. The Institute for Continuing Education was established in 2016 to promote education regardless of age. This means that the institute is mainly for people who chose to pursue a career before obtaining higher education. The institute aims to make a contribution to society by providing general education programs and lectures to enhance the professionalism of citizens. It also operates specialized education program that utilizes the university educational resources. The institute provides various courses, each with different objectives and programs. Students are usually between the ages of forty to sixty. Although many students are from nearby areas, there is no residence restriction for enrollment - some students even come from far-away regions such as Cheonan and Chuncheon. Although only about 500 students per year attended this program during its early stages, enrollment has increased to 1,000. Until now, social contributions at the university have mainly been done by UOS students. They have participated in community volunteer program and donated their talents and knowledge to underprivileged people. These educational volunteering services are incredibly significant because these programs can help establish a close relationship with the community and narrow the education gap between people who are well of and those who are more economically disadvantaged. Furthermore, some students even took it upon themselves to create several community programs for citizens. UOS also has encouraged the efforts of these students by supporting them financially and connecting them to local institutions. The Mentoring Program, in conjunction with the Dongdaemun-gu Office, is a program where university students can become mentors to high school students across the Dongdaemun-gu area. This program was launched in 2012 to support the educational infrastructure and environment of Dongdaemun-gu. “As the participation rate among students is high, UOS’s role in this program is quite important,” said Hwang Kyoung-min, who is an official at the Office of Student Affairs Social Contribution Team. Finally there is the Teenager Education Support by University Students Program which has been active 2013 and is run by the Korea Student Aid Foundation (KOSAF). UOS has been chosen several times to participate in this program. Through this program, university students may guide, teach, and mentor primary and secondary school-aged children. The university students who become mentors receive a scholarship proportionate to the number of hours they have participated in this program. “Through this program, your students will have the chance to learn and grow, and, at the same time, you will, too,” Seong Joon-youp (Dept. of Business Administration, ’17), a participating UOS student, said. “I recommend this program for students who lovechildren,” Seong said. Social contribution plays an important role at the university level. As a public university, UOS is currently performing this role very well. Of course, there are other things that will need an even greater social contribution in the future. “We are planning to establish several campuses in other parts of Seoul. If we have the building space in a particular area, we can host lectures and do lots of other activities for citizens living in that area. Right now, we starting to branch out: we currently operate a small campus at the Seun Arcade and are preparing one near Yongsan Electronics Market,” said Nam, who also is the director of the Office of Planning Affairs. 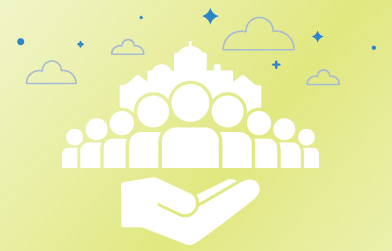 For UOS, social contribution has a strong meaning, especially when it comes to its ties to the local community in its role as a public university. “When the university was first established at 1918, it started as an agriculture school since Korean society was still an agricultural one at the time. Later, as Korean society developed, the school became an industrial university. UOS is now a university that provides higher education to a civil society. During its 100 years of history, UOS has been progressing alongside the society as a whole while addressing its needs, and that will be continued in the future.” Nam said. *Kim Tae-hyeon, A Study on the Improvement of Cooperation between University and Community , The Seoul Institute, December 2015.